I’ve got something super delicious for to add to next weeks meal plan. I have been craving a good taco pizza for quite awhile now, probably at least a month. We have places in my town that have some dang good taco pizzas, but I just haven’t been wanting to splurge calorie-wise too much on food lately. This will definitely be a go to for Taco Tuesday and or Pizza Night from now ON. Eric absolutely could not believe that this was a “lightened” up version! Now, that’s what I like to hear! 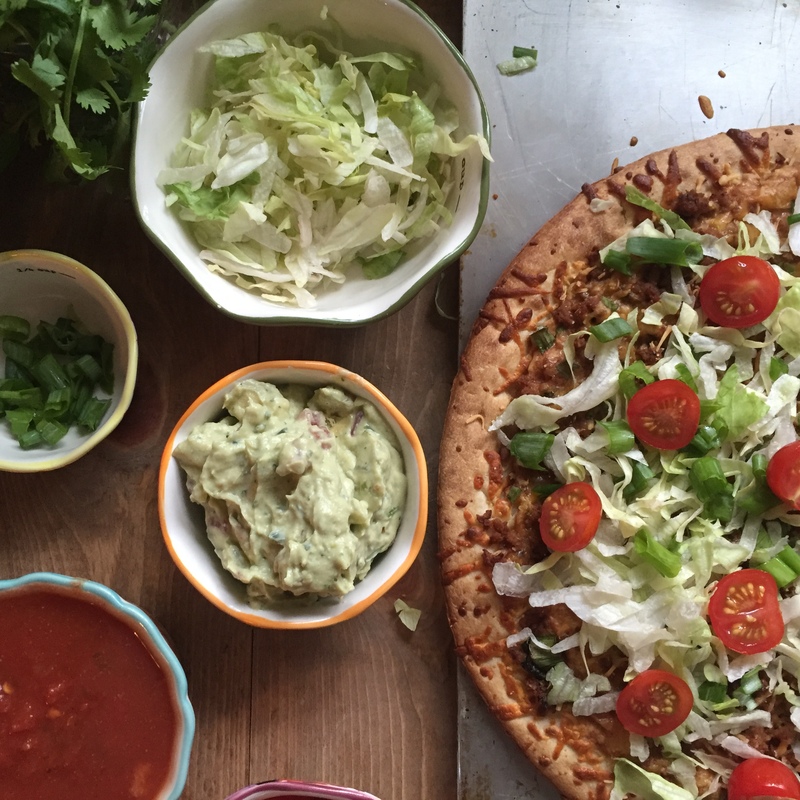 Taco Tuesday Meets Pizza Night. I started with a pre-made crust to make this a super friendly and easy weeknight dinner. I will probably experiment with a homemade crust soon- so check back for that! The layers of refried beans and cream cheese, taco meat, and cheddar cheese are perfection. Topped off with some delicious lettuce, green onion, cilantro, and tomatoes to complete the full taco effect. This was literally thrown together within 15 minutes and took about 10 minutes to bake in the oven. LESS than 30 minutes? Yes Please! Sign me up! Sometimes with little Pepper, I am lucky if I get a whole 30 minutes in the kitchen to make dinner. So I completely understand the demand for 30-minute meals now. Before her, I didn’t. Now I know, those precious babies seriously make time disappear! I hope you enjoy this as much as we did. The recipe calls for TWO pizza’s because this FLEW OFF the pan within minutes. You can easily adjust the ingredients if you just want to make one pizza, but it also reheats in the oven beautifully. I leave the lettuce, onions, cilantro on, but take the tomatoes off when re-heating. I also add another dose of fresh lettuce when it’s been reheated because it does get wilty. (Is that a word?) Well it is now. I also added some light sour cream, salsa, and guacamole to spread on top, that’s totally up to you. But it really, really completed my taco pizza. 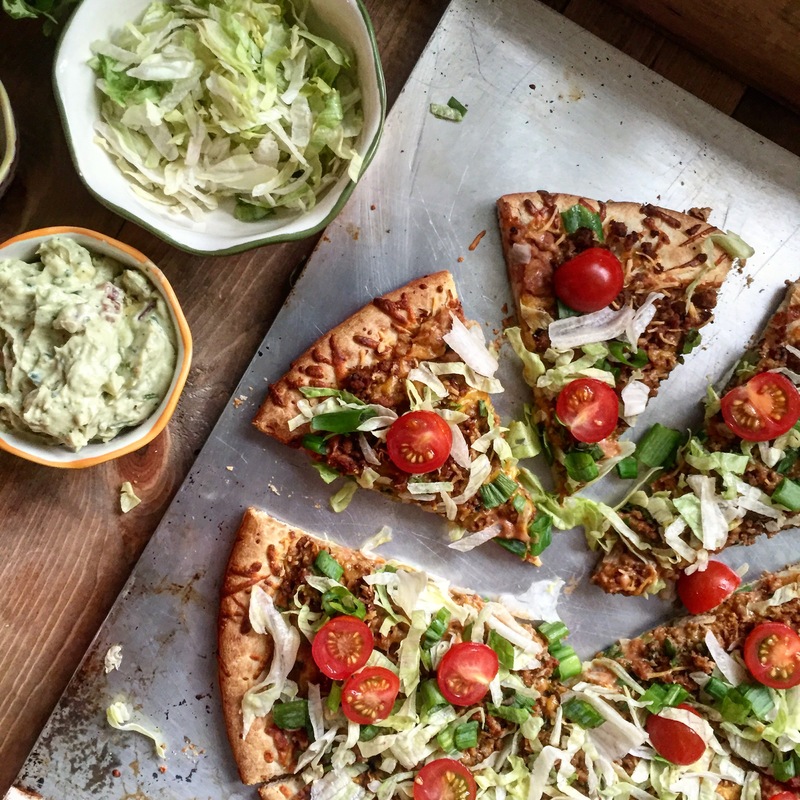 Taco Tuesday meets Pizza Night in the most delicious way possible! In a medium skillet, brown your ground turkey. When the ground turkey is cooked, add your taco seasoning, 1/4 cup green onions, and two tablespoons of cilantro (try not to skip the cilantro part, I promise it makes the meat SO much better!). Mix well and cook all together for 3-4 minutes. In a medium bowl take your refried beans and light cream cheese and mix thoroughly until combined. Take pizza crust, spread half the cream cheese and bean mixture covering the entire thing except for the outer edges. Next, spread 1/2 the taco meat onto the pizza followed by half of the cheddar, cilantro, and green onions. Bake for 10 minutes. 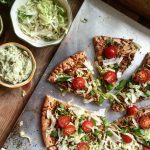 Remove from oven and top with shredded lettuce and tomatoes! Repeat steps 6-8 for second crust. Cut each pizza into 5 slices. Enjoy! 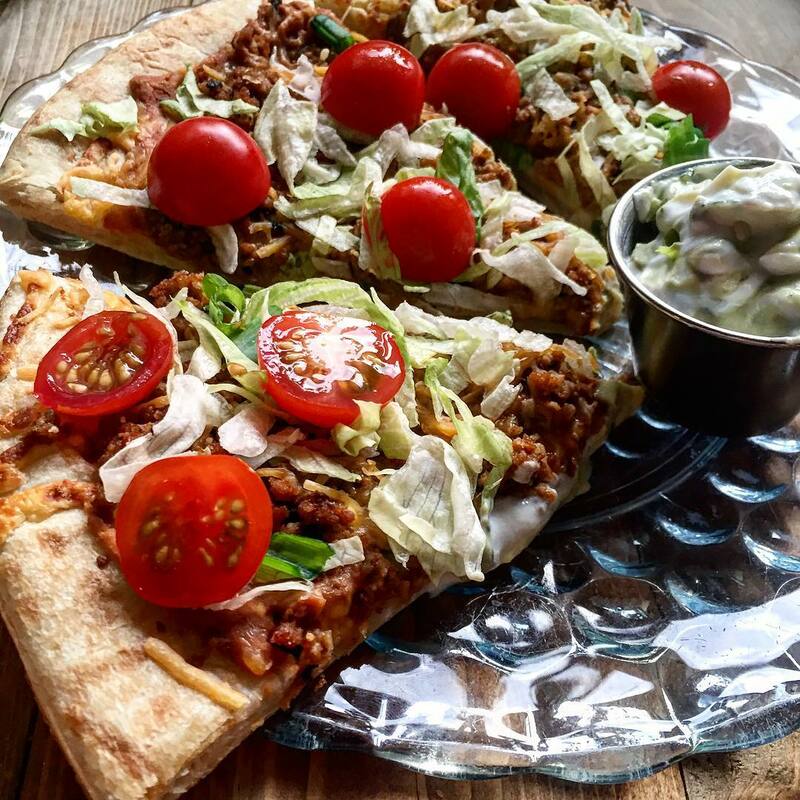 Is a serving of the Taco Pizza 1 slice for 7 SP? Thank you! Yep! using a thinner crust can make the points less too. This recipe is amazing!! What is the serving size? I’ve never considered using taco seasoning to make a pizza. But after looking at how good this looks, I can’t believe that I didn’t think about this before now. I’ve been wanting to try some new pizza flavors for a while now, and this perfectly fits the bill of one that I’d love to try. Thanks for taking the time to walk me through how you made it!